The news can often be doom and gloom, but at this time of year I always look forward to the attention that’s paid to the phenomenon of giving…who to give to, where to buy, what to give, even the motivations and the benefits of giving. I read an article in the Globe & Mail explaining that altruism has long since been considered the ‘noblest of human impulses’ but also states that we can be motivated by selfish reasons. Who can deny how good they feel when they’ve done good for others? Among the many feel good stories about giving this holiday season is that of an elderly Edmonton lady named Jane Van Zyll Langhout, who has received great accolades for her thoughtful outpouring of support for the homeless. Over the past year, she has knit 1,000 hats under the banner of the Share the Warmth campaign. 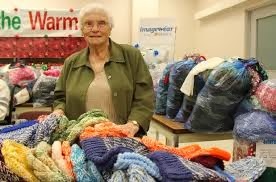 I am impressed not only by her dedication but by her ability to apply her passion for knitting to the benefit of a cause she feels equally strongly about. I think that’s the key to making a difference. What do you feel passionately about? How do you think you can help? This is a perfect time of year to share your passion. You will surely come out feeling like the one who has gained. If you’ve no idea where to start, here are some thoughts about how to choose a cause to support. Don't be shy. I would love to hear from you and how you give back. In the meantime, all the best of the holiday season!